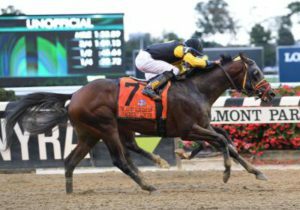 Uriah St. Lewis’ Discreet Lover, ignored at 45-1, sat well off a blistering early pace in the $750,000 Jockey Club Gold Cup (G1) at Belmont Park, moved on the turn to reach contention turning for home, closed strongly down the stretch and was up in the final strides to win by a neck. It’s the second graded stakes win for the 5-year-old Florida-bred son of Repent, trained by his owner, now 44-7-7-7 and the newest millionaire OBS graduate with earnings of $1,354,060. Consigned by Woodford Thoroughbreds, he went through the ring at the 2014 OBS August Yearling Sale.